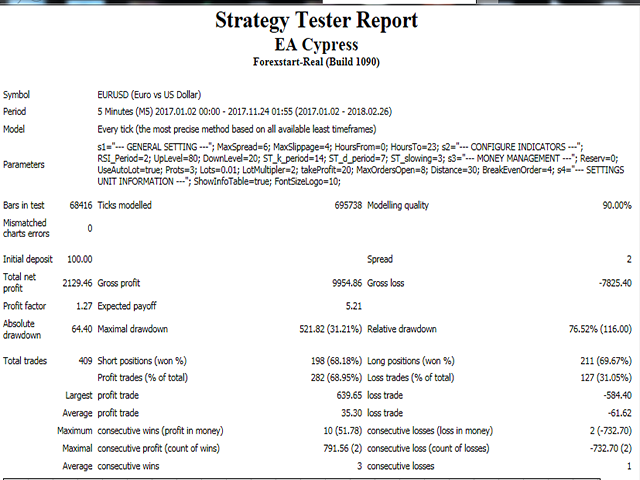 EA Cypress is an expert Advisor for the EURUSD pair, which allows you to trade in a fully automatic mode, as well as to accompany orders opened by the user. To do this, the chart has buttons for switching modes and opening and closing orders. Recommended timeframe is M5. It enters the market based on the RSI and Stochastic indicators. Works market Buy and Sell. It is not provided to work with all the funds, but to leave part of the funds in reserve. When the Show Signal Arrows parameter is enabled, the EA will draw signal arrows on the chart to enter the market, which can be used both for semi-automatic trading and manual trading. 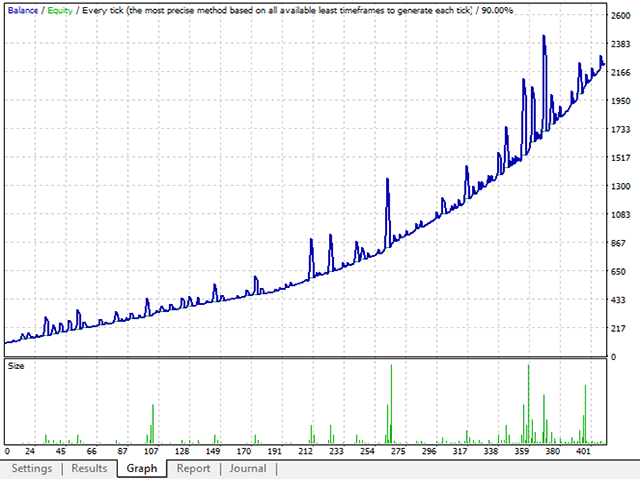 When increasing the drawdown, the EA can close some orders with a profit and leave a couple to achieve more profit. Two parameters are responsible for this, BE Orders Count and BE Profit, points. The EA displays information about open positions in two languages, Russian or English (set in the settings), as well as the status of the account and the current profit. There is a news filter to prohibit the opening of orders during the news release. To make the news filter work, enable WebRequest and add the following address: http://ec.forexprostools.com/ in the terminal settings on the "Expert Advisors" tab . The EA works on both four and five-digit quotes. Parameters specified as 4 digits, the EA will count all 5-digit quotes. Select Language - select the language of information display on the chart. Trading mode - allows you to choose between automatic and manual trading. Max Slippage - Maximum slippage for opening and closing orders. Increase if your broker makes you slippage or quotes come very fast. Stop Open BUY - to Prohibit the open buying orders. Stop OpenSELL - Prohibit opening of orders for sale. Reserve in % - the percentage of reserve funds that will not be used in trading. Use Autolot - true - use autolot; false - Do not use. Percent for Autolot - Percent of funds for autolot calculation. Manual Lot - Lot for trading without using the autolot. When autolot = true is not used. Lot Multiplier - how much to multiply the next locking lot. Variant Multiplier - multiplier Option: SumLot - multiply the sum of opposite orders; LastLot - multiply the last opened lot. Take Profit, points - the number of points for virtual take profit. Max Open Orders, one direction - Maximum number of orders in the market of one direction. Distance, points - At what distance to open lock position. BE Orders Count - the number of orders in the market, after which the EA will start to output all positions to breakeven. BE Profit, points - the number of points to display positions to breakeven. RSI period - Period of RSI (Relative Strength Index). UpLevel RSI - Upper level for RSI and stochastic for opening Sell orders. DownLevel - Lower level for RSI and stochastic for opening Buy orders. K-Period Stochastic - K-period of the Stochastic indicator. D-Period Stochastic - D-period of the Stochastic indicator. Slowing Stochastic - Slowing of the Stochastic indicator. Use News Filter - Enable filter by news or not. Show Signal Arrows - Draw or not on the chart signal arrows to enter the market. Show Info Table - true - Show information block; false - Do not show. Font Size - the font Size of the block of information and buttons. Show Alert Window - Show or not a notification about the signal to open orders. Play Sound Alert - Issue or no notification sound when receiving signals for opening orders. Sound File - sound file for notification. The file must be in WAV format and located in the Sound directory in the folder with the terminal installed. Всем привет! Купил эту сову больше месяца назад и поставил на центовый счёт, к сожалению результат был плачевный! Спустя месяц решил его поставить на реальный счёт у ICM ECN с использованием VPS (депо 500$ с резервом 55%) и сразу же попал на интересную ситуацию, когда сделка не закрылась сразу по ТР, бот с ней мурыжился 2,5 суток, но всё таки вывез в прибыль несмотря на появившийся своп + комиссию, да и следом закрыл в плюс ещё две сделки! Итого, за три дня бот отбил 2/3 своей стоимости (брал со скидкой)! Факты говорят сами за себя. Плюс автор всегда на связи и готов помочь! Ставлю 5 звёзд, совой доволен! P.S. Сегодня ещё две сделки в плюс!!! Сова себя полностью окупила + небольшая прибыль!!! excellent work, great system...all in all an awesome AE! Только жадным тут не место - говорю Вам на перед ! Слушай автора - советы ! Тогда бот не подведет ! Олег, Спасибо - Хороший EA. В будущем планируются обновления для него ? Fixed a bug after the next update. 1. Added news filter to ban trading during news release. For this function to work correctly, you must enable WebRequest and add the address: http://ec.forexprostools.com/ in the terminal settings on the "Expert Advisors" tab. 2. Added the "Use OrderCloseBy Function" parameter. When enabled, which will close open positions with counter orders, which will save on spreads. Check with your broker if they support this feature. If your broker does not support this function, it is not recommended to enable it, because it can cause the terminal to freeze. 4. Added parameter Micro Account - To support trading on micro accounts. 1. Drwadown has been reduced due to improvements in the algorithm moving open positions to breakeven, after reaching the number of orders currently in the market as specified in the BE Orders Count parameter. 2. Added new parameters for notifying order opening signals, for the Recovery mode. Two selectable options: SumLot - volume of the next counter order is calculated based on the sum of opposite orders, which provides the best way out of the drawdown. LastLot - the volume of the next counter order is calculated based on the volume of the last opened order. 2. BE Orders Count=4; - the number of opened orders for the EA to start moving positions to breakeven with a take profit specified in the "BE Profit, points" parameter. 3. BE Profit, points=10; - the number of points to move positions to breakeven. It helps in case of unforeseen situations in the market. 4. Show Signal Arrows=TRUE; - show/hide signals from indicators on the chart as arrows. It is convenient when using the EA for semi-automatic trading in Recovery mode.